The MHRA have suspended the marketing authorisation for levothyroxine 100mcg tablets manufactured by Teva. This follows a review by the Commission on Human Medicines (CHM) which concluded that the Teva product might not be interchangeable with other levothyroxine products. Prescribers should be alert that a change in a patient’s symptoms and TSH status may be attributed to switching between the Teva product and another product. Most patients are unlikely to notice any difference but patients who experience a significant change in symptoms should have their TSH status reviewed and their dose of levothyroxine adjusted accordingly. Gabapentin and Pregabalin are licensed for the treatment of epilepsy and neuropathic pain. Pregabalin is also licensed for use in general anxiety disorder. Recently there have been reports of the potential for misuse of these drugs in order to enhance mood level, to augment the effects of other drugs, to manage opiate withdrawals and cravings or to substitute other drugs such as cocaine. Gabapentin and pregabalin are structurally related to the neurotransmitter GABA and it is this common role for GABA-related effects which is believed to cause the potential for these drugs to be misused by patients. Although some studies focus on people misusing gabapentin with a history of cocaine dependence, anecdotal reports from certain Health Boards across Scotland have highlighted gabapentin misuse by opiate users. While the current evidence around gabapentin and pregabalin misuse is limited, both pharmacists and prescribers should be aware of the potential for misuse of these drugs and be cautious when prescribing either drug, particularly to individuals with a known history of substance misuse. A new three year contract has been agreed within NHSGGC for the formulary preferred choice of nicotine replacement therapy (NRT). From 5th March 2012, the NiQuitin® CQ patches will become the NRT formulation of choice, replacing Nicorette®. Second line products are the NiQuitin® gum and lozenges which may be used for dual therapy also. The change in provider will have significant benefits for the health board financially and in additional support to community pharmacies and patient support material. All other aspects of the NHSGGC Primary Care Smoking Cessation Guidance remain unchanged. We have been made aware of a prescribing error in general practice for Dalteparin injection. 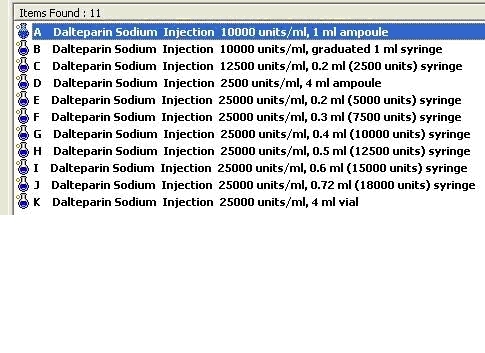 On EMIS these injections appear as below. This listing format means that careful selection of the correct product is required because the total number of units is listed after the units/ml. In the Vision and GPASS systems, only the total units are included in the title. Prescribers should take care to ensure that the correct product is selected. 1. When choosing an ointment base yellow soft paraffin is preferred. 2. Never prescribe a dilution of a topical steroid preparation that needs to be manufactured - all required potencies can be met from the existing commercial preparations. The only potential exception to this would be the dilution of Diprosone® with Diprobase® where the manufacturer allows this dilution. Specially manufactured mixtures are unlicensed and both the stability and potency of these mixtures is unknown. 4. Never mix a coal tar, ichthammol or salicylic acid preparation with a steroid preparation (again due to stability issues and potential unknown effects on the potency of the steroid caused by the change in pH). If for use together they need to be prescribed separately and applied as two preparations. 5. Coal tar or salicylic acid preparations should be prescribed as standard concentrations as included in the approved list (eg 1%, 2%, 5%, 10%, 15% and 20%). McNeil® Products have recently written to prescribers advising of new information regarding cardiovascular risks of domperidone products. They advise that studies have shown that domperidone may be associated with an increased risk of serious arrhythmias or sudden cardiac death. They note the risk is highest in those on daily doses over 30mg or in people over 60 years. They advise domperidone should be avoided in patients taking other drugs known to prolong the QT interval. Prescribers should be cautious using domperidone in patients with known QT prolongation, patients with electrolyte disturbance and those with underlying cardiac diseases such as congestive heart failure. The Heart MCN is reviewing and updating the local Hypertension Guidelines, these are expected to be submitted to the Area Drugs and Therapeutics Committee in April. This follows the publication of new NICE guidelines in England and Wales. Until this review is complete, prescribers should continue to follow the existing NHSGGC Hypertension Guideline.